A hallmark of pancreatic ductal adenocarcinoma (PDAC) is the fibro-inflammatory microenvironment, consisting of activated pancreatic stellate cells, extracellular matrix proteins, and a variety of inflammatory cells, such as T cells, macrophages, or neutrophils. Tumor-infiltrating immune cells, which are found in nearly all cancers, including PDAC, often fail to eliminate the tumor, but conversely can promote its progression by altering the tumor microenvironment. Pancreatic cancer cells are able to attract polymorphonuclear neutrophils (PMN) via tumor secreted chemokines and in human PDAC, PMN infiltrates can be observed in the vicinity of tumor cells and in the desmoplastic tumor stroma, which correlate with undifferentiated tumor growth and poor prognosis. The behavior of tumor-infiltrating neutrophils in the tumor micromilieu is not yet understood at a mechanistic level. It has been shown that PMN have the potential to kill tumor cells, either directly or by antibody-dependent cell-mediated cytotoxicity, but on the other side various adverse effects of PMN, such as promotion of aggressive tumor growth with epithelial-to-mesenchymal transition and increased metastatic potential, have been described. Recent therapeutic approaches for PDAC focus not only the tumor cell itself, but also elements of the tumor microenvironment. Therefore, the role of PMN and their derived products (e.g. cytokines, proteases) as a new vein for a therapeutic target should be critically evaluated in this context. This review summarizes the current understanding of the interplay between proteases of tumor-infiltrating neutrophils and pancreatic tumor cells and elements of the desmoplastic stroma. That tumorigenesis is associated with chronic inflammation, was first described by the German pathologist Rudolf Virchow nearly 150 years ago . His conclusion was based on observations that different leukocytes were frequently found in neoplastic tissues, which Virchow described as “lymphoreticular infiltration”. This observation is still valid today, however a more detailed concept, how the specific inflammatory cells interact with tumor cells and how the tumor cells influence the inflammatory micromilieu was developed over the last decades. In general, all tumors are composed of heterogeneous cell populations including genetically altered tumor cells, non-neoplastic cells (such as fibroblasts, vascular endothelial cells, residual tissue cells), and cells from the innate and adaptive immune system, which are recruited to the tumor microenvironment and hence are activated, creating a milieu with features of chronic inflammation . The interaction between the multiple lineages of inflammatory cells with the tumor and non-neoplastic cells is a highly dynamic process, driving pathways towards proliferation, differentiation, extracellular matrix- remodeling, chemotaxis, angiogenesis, and chemoresistance. Therefore, the understanding of the molecular mechanisms of this interplay represents one of the major challenges to create new therapeutic strategies. The cellular composition of the tumor microenvironment of pancreatic ductal adenocarcinoma (PDAC) consists like other tumors malignant and non-malignant cells, but the uniqueness is its enormous desmoplastic stroma component, consisting up to 90% of the whole tumor mass, seeded with different types of inflammatory cells such as neutrophils, macrophages, myeloid-derived suppressor cells, dendritic cells, lymphocytes, mast cells, and other non-neoplastic cells, such as endothelial cells, stellate cells, fibroblasts, and hematopoietic progenitor cells [3, 4]. In the tumor microenvironment, the different inflammatory cell types synthetize a huge variety of cytokines, chemokines, reactive oxygen and nitrogen species, cytotoxic and cell proliferative mediators, as well as different classes of proteinases (e.g. cysteine-, serine- metallo-). Upon activation, the inflammatory cells release these mediators into the extracellular compartment and aggravate the “smoldering” intra-tumor inflammation. In an orchestrated manner, these mediators create an environment conducting intracellular programs for proliferation, genomic instability, malignant transformation, tumor growth, and progression. Pivotal players of the immune cell released mediators are different types of proteases. Once activated, the members of the different protease families promote amongst others the turnover of the extracellular matrix (ECM), thus facilitating especially angiogenesis and tumor cell migration. The expression of different types of proteases, in particularly (matrix metalloproteinases) MMPs and (a disintegrin and metalloproteinase) ADAMs, in the tumor microenvironment is very heterogeneous and even different types of tumor cells are able to express them, however, the major source of these proteinases are infiltrating stromal (inflammatory) cells into the tumor . The different types of stromal cells found in the cancer micromilieu produce a specific cluster of proteinases (Figure 1), as well as the corresponding proteinase inhibitors, which are released into the extracellular space and specifically regulate themselves prior to their action in the tumor microenvironment . Therefore, the cellular source of the proteases has important consequences on their function and activity in vivo and depends on the local balance between them and their physiological inhibitors. The proteolytic activity of proteases, such as MMPs can be regulated at different levels: gene expression, compartmentalization, conversion from zymogen to an active enzyme, and by specific inhibitors. Stroma cell composition and their proteases. Highlighted (boxed) are here reviewed neutrophils, their expressed and secreted proteases [5-8]. Neutrophils are the most prominent leukocyte type found in the blood circulation (up to 70% of peripheral white blood cells) , and well-studied in their basic biology and in terms of bacterial host defense . In infections, chronic inflammation, and malignancies neutrophil granulocytes are systematically expanded in the bone marrow and released towards the site of disease or tumor in response to chemotactic factors (such as granulocyte-macrophage CSF, macrophage CSF granulocyte CSF, or neutrophil-attracting CXC-chemokines). The chemoattractants are released from the micromilieu of the pathologic site (reviewed in: [12-15]). PMN are frequently observed in the microenvironment of different types of tumors - however their pathophysiological roles in the context to tumors are “understudied”. The modest interest is probably based on the old dogma of their short life time. But this statement no longer holds true, due to observations that neutrophils in inflammatory environments can survive up to 5-6 days . In infections, PMN are triggered by chemotactic stimuli, thus migrating into the pathogen-infected area and phagocyte the microbes. For the elimination and degradation of microorganisms, reactive oxygen species (ROS), defensins, and serine-proteinases are rapidly shuttled to phagolysosomes, where they kill the invading microorganisms. In parallel, proteinases are released in huge amounts into the extracellular compartment to overwhelm their endogenous inhibitors and to accomplish focused proteolysis. The influx of PMN to the inflammatory microenvironment is followed by monocytes and dendritic cells which are recruited through chemoattractants, secreted by neutrophils, such as CCL2 , CCL3  CCL19, and CCL20 . PMN produce, store, and release a variety of serine-proteinases (e.g. neutrophil elastase, cathepsin-G, and proteinase-3), matrix metalloproteinases (e.g. MMP-8 and MMP-9) reactive oxygen species (ROS), different cytokines and chemokines, antimicrobial peptides, and the metal chelator proteins lactoferrin for Fe and calprotectin for Mn and Zn . An intact neutrophil function is essential for survival of the host. The failure to resolve the inflammation due to malfunction or elimination of apoptotic neutrophils leads to accumulation of cytotoxic substances and is associated with severe pathologies. Disorders of PMN function in humans are characterized by recurrent invasive infections and early mortality. An example is chronic granulomatous disease, where PMN are unable to kill the microorganisms they had engulfed, due to the failure to produce reactive oxygen species. These patients suffer from severe infectious diseases, such as pneumonia, soft tissue and bone infections, and sepsis, resulting in a high mortality. In the last years, PMN received attention in the context of inflammation driven tumorigenesis . There is a concept that tumor associated neutrophils (TAN) might have different states of activation/polarization. Depending on the local concentration of TGF-β they can acquire a pro-tumor phenotype (N2 TAN) induced by high concentrations of this cytokine. In a TGF-β negative milieu in the presence of IFN-γ they resemble an anti-tumor phenotype (N1 TAN) [13, 21]. The N1 TAN counteract the tumor progression through tumor cell toxicity and enhancement of the antitumor immune memory response. On the other hand, the N2 TAN promote tumor growth, invasion, and metastasis through degradation of ECM, promotion of neovascularization, and immunosuppression . Aside from migration into the tumor, it is discussed that TAN may also differentiate from myeloid-derived suppressor cells present in the microenvironment . Therefore, one should mention that neutrophils are thought to have “direct relatives” in the population of the myeloid cells, the so called myeloid-derived suppressor cells (MDSC). MDSC are a very heterogeneous population of immune-suppressive cells, which characterization is still not finished and conflicting . According to the current understanding MDSC are composed of cells in progenitor stage, in immature and more maturated forms . According to their surface expression profile, murine studies subdivided MDSC into cells with more monocytic characteristics, so called mononuclear (Mo-MDSC) or correspondingly with granulocytic characteristics (G-MDSC). Most likely this two-sided separation does not hold true in humans, where more subsets are discussed . Of importance is the fact that a significant overlap (e.g. in the expression of functional molecules or surface molecules) between neutrophils and G-MDSC exists, raised a couple of theories that both cell types might originate from a common progenitor cell and either enter the tumor micromilieu as finished cell due to lineage separation in the myelopoesis, or that a mature neutrophil transdifferentiate in the tumor micromilieu towards a tumor-associated neutrophil or a G-MDSC [15, 23]. At least one can state that G-MDSC not only have immunomodulating abilities but are also able to induce tumor cell migration or angiogenesis by the secretion of a variety of different proteases has been shown . A comparison of peripheral neutrophils, tumor-associated neutrophils, and G-MDSC in a murine mesothelioma model showed that e.g. neutrophilic elastase was expressed to a similar level in all three groups, whereas the expression of several matrix metalloproteinases (e.g. MMP8, MMP9) varied . Although a relationship between these cell types is overt, the present review will focus on neutrophils. As mentioned above, PMN were originally studied in the context of host defense against invading bacteria, but now are also recognized as major protagonists of acute and chronic inflammation, and were shown to display immunomodulatory functions in the context of cancer . 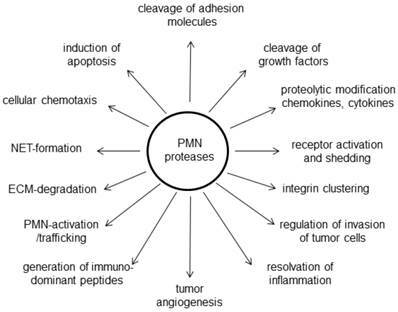 Here, we review the recent understanding of the role of PMN in the pancreatic cancer microenvironment with special emphasis on their proteinases, which, depending on the circumstances, may either suppress or promote tumorigenesis, or even act independently of their proteolytic activity. Until today only a limited number of studies are available, however, to our knowledge all showed that presence of increased amounts of neutrophils in the tumor, often referred as tumor associated neutrophils (TAN), is associated with poor clinical outcome . A link from infiltrating immune cells, such as neutrophils, in the micromilieu is directly tied to the role of Ras oncogenes, which are crucial for the promotion of malignant cellular transformation. Sparmann and Bar-Sagi demonstrated that the inflammatory chemokine CXCL-8 (synonym: interleukin-8 or IL-8) is a transcriptional target of Ras signaling. In a tumor xenograft model, they show that Ras-dependent CXCL-8 secretion is required for the initiation of tumor-associated inflammation and neovascularization and concluded that Ras oncogene can elicit a stromal response that fosters cancer progression . Tumor cells for example from bronchial carcinoma or PDAC are able to attract PMN via tumor secreted chemokines such as CXCL-8  or CXCL-16 . The systemic inflammatory response from pancreatic cancer cells promotes the infiltration of neutrophils, which provide a favorable tumor environment for cancer progression, by the secretion interleukins IL-2, IL-6, IL-10, tumor necrosis factor-alpha (TNF-α), and vascular endothelial growth factor (VEGF) . In human PDAC, PMN infiltrates can be observed in the vicinity of tumor cells or in the stroma, which correlate with undifferentiated tumor growth and poor prognosis [31, 32]. Similar findings have also been observed in animal breast cancer models , renal cancer , or lung cancer . In addition increased peripheral blood neutrophils are described in cancer patients . The correlation between TAN and tumor progression is not yet understood at a mechanistic level . Some studies indicate that PMN have the potential to kill tumor cells, either directly  or by antibody-dependent cell-mediated cytotoxicity . However, various adverse effects of PMN, such as promotion of aggressive tumor growth and increased metastatic potential, have been described [34, 38]. One hypothesis is that PMN-derived matrix-degrading proteases such as the metalloproteinases MMP-8, MMP-9, and MMP-17, or neutrophil elastase can modulate the composition of the extracellular matrix and facilitate metastasis . Moreover, TAN are a major source of various pro-inflammatory cytokines such as IL-12, TNF-α, and GM-CSF, and chemokines such as CCL-3, CXCL-8, and CXCL-10, which can affect the migration of cancer cells and immune cells [21, 30]. Increased TNF-α and IL-10 levels lead to a decrease in the lymphocyte count as well as lymphocyte dysfunction [39, 40]. An imbalance of infiltrating immune cells may result in an inadequate immunologic reaction to cancer cells. The ratio of elevated neutrophils and decreased lymphocytes (neutrophil lymphocyte ratio; NLR) is associated with poor prognosis for cancer patients and this NLR could be a used as a marker for evaluating the systemic inflammatory response and outcome of individuals . In addition, PMN are potent inductors of angiogenesis via VEGF or by the release of oncostatin-M, which induces cancer cells to secrete proangiogenic factors like VEGF [42, 43]. Reactive oxygen species, which were historically thought to be key factors in defense against bacteria and microbes, have been found to induce DNA damage of colonic epithelial cells and thus promote tumor induction and progression . It was also reported that PMN-derived nitric oxygen species (NOS) can suppress T cell function . Another means of host defense against bacteria are neutrophil extracellular traps (NETs), extruded DNA networks containing histones, granules, adhesion molecules, and proteases, which have been shown to promote circulating tumor cell adhesion and pulmonary metastasis . A single murine study comparing only 4 mice with injected tumors, describes substantial differences in the expression of genes related for granule proteins, respiratory burst, cellular structure, apoptosis, and cytokine and chemokine production between TAN and peripheral blood PMN . In a study by Reid et al. the histological evaluation of approximately 500 pancreatic tumors revealed a preferential association of neutrophils to certain types of pancreatic neoplasms and that it occurred in a tumor-type- and cell-lineage-dependent manner. Among invasive pancreatic carcinomas, TAN were frequently observed in carcinomas with a micropapillary or undifferentiated growth pattern. In cystic pancreas tumors, neutrophils were preferentially associated with neoplasms of the pancreatobiliary-type lineage, detected in a significant proportion of the mucinous cystic neoplasms (MCN; in their carcinoma in-situ component) as well as in pancreatobiliary-type intraductal papillary mucinous neoplasms (IPMN) . Whether the TAN were secondarily recruited by specific histologic groups of tumors or are primarily participating in their development is uncertain. At the moment, no detailed analyses of human TAN are available. However, a number of neutrophilic proteases were investigated in the context of pancreatic tumors (Figure 2). One note of caution has to be regarded in studying the role of neutrophils in (pancreatic) cancer. Although there are good and established mouse models for PDAC, they might not reflect the role of PMN in patients: Marked differences between human and murine PMN exist not only with regard to the percentage of circulating cells (70% in humans versus 30% in mice), but especially with regard to numerous granular proteins . The enzymes human neutrophil elastase, as well as human cathepsin G and human proteinase 3 are the three most prominent serine proteases, stored in the azurophilic granula of neutrophil granulocytes . A single neutrophil contains up to 1 pg neutrophil elastase, rising this enzyme to a most abundant enzyme . The neutrophil elastase gene is named neutrophil elastase 2 with the gene symbol ELA2 to differentiate it from pancreatic elastase 1 and pancreatic elastase 3 (ELA1 and ELA3A and ELA3B). Originally thought to be a mediator of the host defense against bacteria , there is evidence that neutrophils release this enzyme in other chronic (abacterial) inflammatory settings such as psoriasis as well as in the cancer micromilieu [50, 51]. Neutrophil elastase degrades a variety of substrates including elastin, collagen, cadherins, proteoglycan, fibronectin, platelet receptors, complement receptors, thrombomodulin, lung surfactant, and growth factors (granulocyte-colony-stimulating factor, stromal cell-derived factor-1, and their respective receptors, G-CSFR and CXCR4). Neutrophil elastase mostly releases and acts locally but can be also detected in serum . Among others, the major natural inhibitor of neutrophil elastase is α1-antitrypsin. Neutrophil elastase and α1-antitrypsin are a pair of protease and protease-inhibitor counterparts and an imbalance due to genetic aberrations in one of them is associated with for example with early onset of chronic liver disease, lung emphysema, bronchiectasis, asthma, rheumatoid arthritis, or aneurysma. Recently, it was reported that the imbalance of elastase and its inhibitors plays a significant role in cancer development and progression of malignant tumors, such as liver, lung, or colorectal cancer . It is self-explaining that infiltrated neutrophils are the major source of neutrophil elastase in tumors and an increased concentration of neutrophil elastase in tumors is associated with late-stage disease and poor survival, in different tumors as breast cancer or lung cancer . That neutrophil elastase has not only matrix degrading effects on the extracellular stroma [54, 55] was shown by its presence in neutrophil extracellular traps (NET) and in NET formation. [56, 57]. Additionally, we showed that neutrophil elastase actively promote pancreatic tumor cell migration and invasion . Another group reported that the treatment of pancreatic cancer cells with a specific neutrophil elastase inhibitor ONO-5046.Na, reduced the proliferation activity as well as the migratory capacity of pancreatic cancer cells . A rather explanation is that neutrophil elastase cleaves the tumor-cell adhesion molecule E-cadherin, allowing them to separate from the “main” tumor, followed by migration and invasion . Moreover, the cleavage of E-cadherin on pancreatic (and liver) tumor cells induces an epithelial to mesenchymal transition of the tumor cell. Due to the loss of contact, the tumor cells lose their polarity and in line epithelial phenotype markers such as cytokeratins, and upregulate on the other hand mesenchymal transcription factors such as TWIST and Zeb1 and translocate β-catenin from the cytoplasm to the nucleus . Of note, in a large cohort of human PDAC samples there was a negative correlation of the neutrophil infiltrate and the expression of E-cadherin on tumor cells  as well as a positive correlation of the neutrophilic infiltrate with nuclear accumulation of β-catenin and of ZEB1 expression in tumor cells. Another pro-metastatic mechanism might be that neutrophil elastase promotes the adhesion of pancreatic tumor cells on endothelial cells . On the other hand, a study demonstrated a beneficial role of neutrophil elastase in a murine PDAC model, where a cleavage and thus activation of antithrombine inhibits tumor neoangiogenesis . Based on the fact that neutrophil elastase is as a multifunctional enzyme with other abilities, (such as the cleavage of growth factors EGF or TGF-β from tumor cells , the regulation of crucial receptors such as EGFR and TLR4, or modulation of cytokine production ) it is to be assumed that also more biological functions in the pancreatic tumor microenvironment are likely. Neutrophil serine proteinase 3 and the above described neutrophil elastase are homologous antimicrobial serine proteases of the neutrophils. They are key regulators of the inflammatory response and therefore considered as important cellular targets in a number of chronic inflammatory diseases. Both in common are the sequence identity of 56%, structural similarity, and preferential cleavage of peptide bonds after small hydrophobic amino acids. PR3 can be released extracellularly at sites of inflammation where it plays a crucial role in the pathogenesis by degrading elastin and other matrix proteins causing tissue destruction that may lead to chronic obstructive pulmonary disease, cystic fibrosis, acute lung injury, and inflammation of blood vessels [63, 64]. α-1-antitrypsin is the most important circulating inhibitor of PR3 and individuals with low serum levels of α-1-antitrypsin could develop disease in lung, liver and pancreas. Elevated levels of PR3 were recently reported in patients with type1 diabetes (T1D) and circulating NE and PR3 levels increased progressively with the increase of the positive numbers and titers of the autoantibodies against β-cell antigens . Increased NE and PR3 in T1D patients are closely associated with elevated formation of neutrophil extracellular traps. By contrast, the circulating levels of α-1-antitrypsin were decreased in T1D patients. These findings support an early role of neutrophil activation and augmented neutrophil serine proteases activities in the pathogenesis of β-cell autoimmunity which is discussed to display a risk factor for PDAC . Another major neutrophilic serine protease is cathepsin G, a member of the large family of cathepsins . Whereas in general tumor-promoting roles of cathepsin family members such as B, D, and others have been described for pancreatic cancer , as well as their particular inhibition was raised as potential therapeutic approach in PDAC , little is known about the role of cathepsin G in pancreatic cancer. Cathepsin G, which is stored in azurophilic granules of neutrophils as inactive preform, displays a variety of intra- and extracellular functions linked to tumorigenesis. The tumorigenic activities of cathepsin G include extracellular matrix degradation  cytokine/chemokine and receptor processing or shedding [70, 71], induction of chemotaxis of immune cells , increased tumor cell invasivity , but also induction of apoptosis when entering into the cell followed by the activation of caspases . In addition, cathepsin G mediates tumor-cell adhesion in breast cancer cell by induction of E-cadherin . Proteomic profiling of normal, chronic pancreatitis, and pancreatic cancer tissues revealed an upregulation of cathepsin G protein 1.9 fold in chronic pancreatitis, respectively 2.4 fold in PDAC tissue comparing to normal tissue samples . However, this study does not separate the specific cell types producing cathepsin G. It is known that neutrophils are the most prominent source of cathepsin G, although pancreatic cancer cell lines are also able to express and secrete cathepsin G . Interestingly, pancreatic cancer cells are also able to induce cathepsin G expression in myofibroblastic cells . This data reflect that not only tumor-infiltrating neutrophils are a source of cathepsin G. In addition, SERPIN-A3, an inhibitor of cathepsin G, was shown to be overexpressed in PDAC , whereas TFPI2, another cathepsin G inhibitor is downregulated in PDAC . Therefore one might speculate about complex networks regulating the serine protease cathepsin G in PDAC, due to its upregulation in a diversity of sources interacting with inhibitors. In spite of the described abilities of cathepsin G, the data about its role in PDAC are rare and needs further investigation. MMP-8 is a Zn2+ metalloendopeptidase, predominantly expressed by neutrophils. MMP-8 is also expressed in few melanoma cell lines, chondrocytes, rheumatoid synovial fibroblasts, activated macrophages, smooth muscle cells, and endothelial cells . In the tumor microenvironment MMP-8 reveals pro-host properties due to its potential to resolve an inflammation. This property is likely based on the fact that MMP-8 cleaves the neutrophil released chemokine CXCL-5 which exerts an enhanced attraction for neutrophils into the inflamed area. In murine models, it could be demonstrated that MMP-8 has a protective role in cancer through its ability to regulate the inflammatory response induced by carcinogens dimethylbenzanthracene and phorbolester (TPA) . Furthermore, a decreased expression of MMP-8 was associated paradoxically with enhanced breast cancer metastasis . For pancreatic cancer it has been described that an intratumor overexpression of MMP-8 facilitates the spread of oncolytic adenovirus, leading to a decrease of the tumor mass . In a cohort of PDAC tissues, it was shown by immunohistochemistry that in approximately 75% of PDAC samples not only the tumor infiltrating neutrophils express MMP-8, but also the tumor cell itself . Sequestration of neutrophils within the pancreas is generally believed to be an early and important event in the evolution of pancreatitis. MMP-9 is present in considerable amounts in the granules of neutrophils and has been associated with pancreatitis [85, 86]. The massive infiltrate of neutrophils followed by their degranulation results in an extensive liberation of host defense proteins including MMP-8 (neutrophil collagenase), MMP-9 (gelatinase B), and NGAL (neutrophil gelatinase B-associated lipocalin). These last two proteins are forming a covalent linkage called NGAL-MMP9-complex. NGAL was previously reported to be overexpressed in pancreatic cancer . Terris et al identified NGAL as a marker for intraductal papillary mucinous neoplasm (IPMN) a benign cystic tumor which can transfer to an invasive carcinoma . The expression of NGAL was also found in various grades of the precursor lesions pancreatic intraepithelial neoplasia (PanIN) including the PanIN-1 stage lesion and therefore was suggested as a marker of the earliest premalignant changes in the pancreas . The function of the NGAL-MMP-9 complex is not yet fully elucidated. It was proposed that MMP-9 covalently linked to NGAL protects MMP-9 from autodigestion . An alternative hypothesis is that NGAL supports an allosteric activation of pro-MMP-9 . Matrix metalloproteases are the major factors that degrade the extracellular matrix. The gelatinases as subfamily composed of MMP-2 (gelatinase A) and MMP-9 (gelatinase B) so called type IV collagenases were originally named for the ability to digest type IV collagen of the basement membrane . In addition they were also found to possess a potent gelatinolytic activity that degrades collagen types V, VII, IX, X, fibronectin, and elastin . The degradation of basement membranes and extracellular matrix plays a key role in the severity of inflammation and tumor progression. MMP-9 converts also other substrates as well and in particular cases can have a regulatory function. For instance, the neutrophil chemokine CXCL-8 is potentiated by amino-terminal truncation of six amino acids . Furthermore, MMP-9 cleaves the big endothelin ET-1(AA 1-38) into ET-1(AA 1-32) that activates neutrophils and promotes leukocyte-endothelial cell adhesion and consequently, neutrophil trafficking into inflamed tissues areas . Aside from these functions as a regulator and effector molecule in inflammation , MMP-9 increased proteolytic activity may further mediate pathological conditions leading to autoimmune diseases by the generation of immunodominant peptides [94, 96]. Overexpression of MMP-2 and MMP-9 in pancreatic cancer was previously reported [97, 98], and the gelatinases were also investigated as differential markers for CP/PDAC [99-101]. MMP-9 was originally thought to be involved in tumor angiogenesis indirectly by remodeling of the extracellular matrix  and interacting with VEGF [103, 104]. Nozawa et al. demonstrated that inflammatory cell derived MMP-9 is able to mobilize VEGF sequestered within the extracellular matrix  and particularly MMP-9 is very efficient enzyme for this release . Other group showed that MMP-9 derived from PMN is a direct and potent factor in pancreatic tumor angiogenesis. They demonstrated that MMP-9 and PMN alone induced a robust in vitro angiogenesis, even in the absence of VEGF and in the presence of antibodies to VEGF. Thus PMN derived MMP-9 has a direct proangiogenic effect in addition to its additive VEGF interaction and is essential for tumor-associated blood vessel formation and tumor growth . The ADAMs (a disintegrin and metalloproteinase) are a family of transmembrane and secreted proteins involved in cell adhesion and proteolytic cleavage of the ectodomains of diverse cell surface receptors and cell signaling molecules. Most ADAMs are membrane-anchored and function in the pericellular space. Thirteen of the currently known 21 ADAMs have proteolytic properties and influence the cell signaling within the tumor microenvironment. ADAMs fulfill a broad spectrum of functions and have been implicated in neurological and cardiovascular diseases, asthma, infection, inflammation and cancer [7, 8]. In pancreatic cancer it was shown that ADAM8 expression is associated with increased invasiveness and reduced patient survival  and that ADAM10 is required for pancreatic cancer cell migration and invasion . Silencing of ADAM10 in pancreatic cancer cells, decreases their CXCL-16 liberation, and thus inhibits the migration of neutrophils . Furthermore, neutrophilic ADAM10 is required for normal neutrophil migration towards sites of inflammation . ADAM9 is known to be expressed by monocytes and macrophages and it was recently reported that ADAM9 is also a product of human and murine PMN . ADAM9 is likely transcribed by PMN precursors in the bone marrow and stored as a preformed proteinase within PMN granules and vesicles. ADAM9 is redistributed to the PMN surface when PMN are activated by proinflammatory mediators as is the case for PMN-derived serine proteinases and MMPs . ADAM9 degrades several extracellular matrix proteins, including fibronectin, entactin, laminin, and insoluble elastin, as potently as MMP-9. Furthermore, ADAM9 was described to activate neutrophils . Aside of ADAM9, ADAM8 , and ADAM17  are further members of the ADAM family known to be expressed by primary PMN. In mice ADAM9, 10, and 17 are potential mediators in the biology of the pancreas with distinct dynamic expression patterns during pancreas development and maturation . ADAM17 has been discovered to be an important proteolytic sheddase of ALCAM and by this cleavage enhancing tumor cell motility and migratory capacity and therefore the metastatic potential . Kahlert et al. could show that ADAM17 is significantly overexpressed in pancreatic cancer compared to normal pancreatic tissue and that the disruption of ALCAM-mediated cell adhesion is a relevant step in pancreatic cancer progression and early relapse of disease . In close relation to ADAMs and MMPs are the ADAMTS (a disintegrin and metalloproteinase with thrombospondin motifs) families, members of the superfamily of zinc-endopeptidases so called metzincins . Activated neutrophils were shown to produce ADAMTS-family members . The ADAMTS have a protease domain, an adjacent disintegrin domain, one or more thrombospondin domains and are generally secreted and soluble. They play roles in ECM assembly, ovulation, and cancer. The role of these metzincin proteinases in cancer has been extensively reviewed by Murphy . Masui et al. investigated the expression of ADAMTS-1(METH-1) in human pancreatic cell lines and pancreatic cancer tissue and in surrounding noncancerous pancreatic tissue specimens. They observed that pancreatic cancer samples with higher expression of ADAMTS-1 showed significantly frequent lymph node metastasis or retroperitoneal invasion, most likely due to the cleavage of substrates in the surrounding ECM such as heparan-sulfate proteoglycans syndecan-1, and glypican-1, all shown to be overexpressed in pancreatic cancer. Azurocidin (also known as CAP37 or heparin-binding protein) is a member of the serine protease family, but without protease activity . It is an abundant protein of neutrophils, mediating especially the extravasation of PMN and antimicrobial activity towards bacteria or candida species . The role in the tumor micromilieu of PDAC is not known. The poor stromal reaction in PDAC areas of neutrophils might not only result from digestion of the extracellular matrix, but also to other regulatory effects of proteases, such as induction of apopotosis. Whereas a decrease of apoptosis in endothelial cells mediated by azurocidin was described , another study shows in human umbilical vein endothelial cells an interference of azurocidin to the mitochondrial metabolism followed by the induction of apopotosis . Our data indicate that PMN are activated by pancreatic stellate cells and secrete upon activation azurocidin, which in turn causes a “quiescent” status of pancreatic stellate cells (Gaida MM unpublished data). Pancreatic cancer is characterized to be a therapy-refractory cancer. Indeed, novel therapeutic approaches in PDAC are urgently needed, because it is a highly aggressive neoplasm with a 5-year survival rate of approximately 5%, and the limited therapeutic options are only effective in early stages of disease . There is a rising body of interest in the development of so called “stroma targeted therapies”, not only for the cancer cell itself, but also for the cells of the micromilieu, which reveal a more stable and predictable behavior, compared to the tumor cell. Considering this facts, immune cells may become a primary target, not simply for the prediction of the prognosis, but more for the direct treatment and intervention of cancers including, PDAC. Depending on the activation state and their released mediators they may either act tumoricidal or conversely enhance tumor growth. Considering neutrophils as a potent source of protumorigenic mediators favoring cancer development and progression, there are several reasons to target PMN, respectively their released products: PMN possess a very efficient migration machinery and can be quickly recruited to areas of early cancer development and interact with tumor cells in the very early steps of malignant transformation. They can migrate in and out of the tumor microenvironment, transferring important signals, and can also be detected in the peripheral circulation. Primed by cancer cells, they have a prolonged life cycle and can reside in the tumor microenvironment for several days. Additionally they are equipped with a variety of matrix-remodeling proteinases which can modulate the tumor microenvironment. Thus the identification of PMN derived and released tumor promoting substances may lead to novel therapeutic approaches. Most of their proteins are premade in the bone marrow, and stored in their granules. Several proteases, in particular MMPs, were described to be upregulated in different cell types in malignant tissues thus showing an enhanced capability to digest various proteins of the extracellular matrix. Therefore, since several decades, proteases are in the focus as targets also for (pancreatic) cancer therapy [126, 127]. Unfortunately, the development of synthetic MMP-inhibitors and their tests in preclinical trials were not promising  but at the same time shed light on the biological functions of MMPsin the context of tumors. Additionally to the components of the ECM also other non-matrix substrates of MMPs were identified as targets including other proteinases, proteinase inhibitors, clotting factors, chemotactic molecules, growth factors, growth factor binding proteins, cell surface receptors, and cell-cell and cell-matrix adhesion molecules (reviewed in ). MMP cleavage events are associated with both stimulation and repression of cellular proliferation, with enhancement and abrogation of apoptosis, and increased and decreased chemotaxis and migration. Consequently, certain MMP activities may aggravate a pathological condition, whereas others may be beneficial to the host . 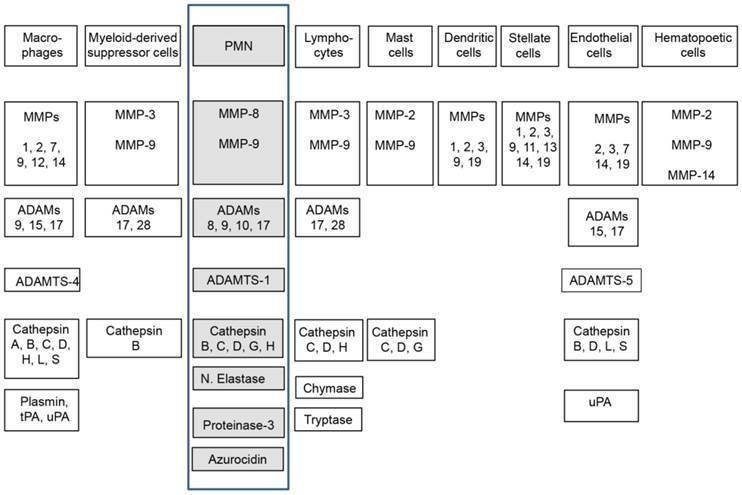 An understanding of the biological outcome of MMPs cleavage products is required for the therapeutic application of MMP inhibitors to the treatment and prevention of complex diseases. Additionally a new focus of research is the non-proteolytic function of MMPs. Dufour et al. demonstrated that the hemopexin domain of MMP-9 is essential for the MMP-9 mediated epithelial cell migration [131, 132]. In CLL the hemopexin domain of MMP-9 prolongs the B cell survival through binding to B cell surface receptors and prevents cell apoptosis . A plethora of synthetic substrates have been postulated mainly based on in vitro studies , few have been identified as a true substrate in an in vivo context . The therapeutic implications for neutrophil elastase inhibitors in malignomas were tested, mainly in vitro but also in animal models, and a variety of substances have been shown to inhibit neutrophil elastase, such as designed natural occurring peptide-inhibitors binding to the active site of the enzyme e.g. α-1-antitrypsin or human monocyte/neutrophil elastase inhibitor (M/NEI), the natural products heparin or epigallocatechin-3-gallate from green tea, different fatty acids, or synthetic neutrophil-elastase inhibitors such as coumarin or the antibiotic-family members beta-lactame or cephalosporins . In an in vivo mouse study for lung cancer, it was shown that the treatment of genetically-modified LSL-K-ras mice with the specific neutrophil elastase inhibitor ONO-5046, significantly reduced the tumor growth . Furthermore the treatment of mice with the neutrophil elastase inhibitor GW311616A, prevented the formation of metastasis in a lung cancer model . A couple of other studies showed that a specific inhibition of neutrophil elastase can inhibit the development, growth and the progression of a variety of tumors, including lung and colonic cancer . Data for PDAC are rare. An in vitro study with the neutrophil elastase inhibitor ONO-5046, described an inhibition of proliferation and chemotaxis of the tumor cells . Regarding the clinical implication of cathepsin G treatment in PDAC, to our knowledge, no studies are available. But, the inhibition of cathepsins is discussed as therapeutic approach for PDAC . Due to the fact that a variety of neutrophil elastase and cathepsin G inhibitors are available as well as neutrophils display a significant population in the pancreatic cancer microenvironment [29, 50, 109], studying their role as additional treatment options in PDAC might be useful. Therapeutic approaches for inhibition of ADAMs are still preliminary. Similar to the MMPs they exert proteolytic and non-protease functions and most attempts to develop therapies against cancer were made for the targeting of proteolytic ADAMs. Learned from the experiences and pitfalls with early generation of synthetic MMP-inhibitors more caution was put into the development of highly selective active site directed inhibitors for individual ADAMs . Recent interest in selective inhibition of ADAM17 is its modulation of ErbB/EGFR signaling in the focus of immune diseases, inflammation and tumorigenesis . ADAM17 is produced by neutrophils and also found overexpressed in pancreatic cancer . Recently Ardito et al. applying a murine pancreatic tumor model showed that genetic ablation or pharmacological inhibition of ADAM17 effectively eliminates KRAS-driven tumorigenesis in vivo . Excessive release of proteases mediates tissue remodeling and damage, and therefore a marked neutrophil accumulation, as source of several important proteases, has an important role in the pathogenesis of many diseases, in particular inflammation and cancer. In this short review, we discuss the influx and role of neutrophils into the pancreatic cancer microenvironment, with special emphasis on their proteases. There is increasing evidence that proteases released from neutrophils are pivotal players in tumor initiation and progression, also in pancreatic cancer, which is especially characterized by distinct inflammatory reaction in its microenvironment. Those neutrophils are not only “bystanders” in the tumor micromilieu but “active players”, releasing a variety and high amounts of biological active proteases. Although found in the majority of PDAC tissues, the data about the role of PMN are limited. It is widely accepted that pancreatic cancer progression is highly dependent on factors released by the tumor micromilieu, and when progressed, this tumor is basically refractory to standard chemo- and radiotherapies. Therefore, the understanding and interaction with the inflammatory micromilieu of PDAC it seems to be an additional vein to establish new therapeutic options.